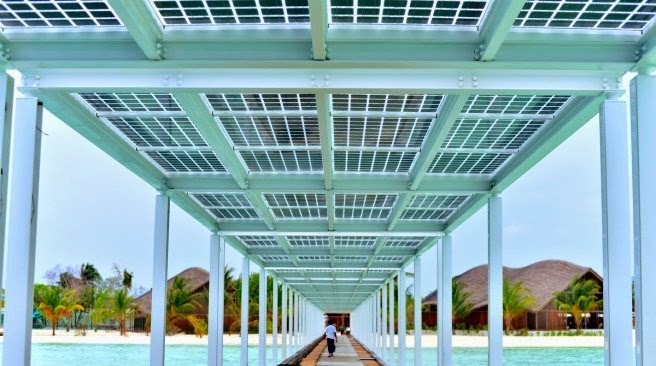 Maldives has been introducing a range of eco-sustainable initiatives, but Club Med Finolhu Villas actually introduces you to their resort with an imposing eco-investment – a solar panel jetty. 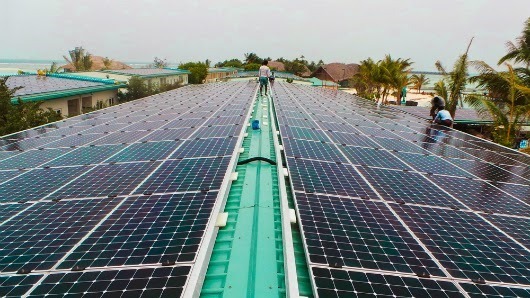 In a part of the world with so little real estate but so much sunshine, the pressing question is ‘where do you find the space to put solar cells.’ Well, resorts face the same question for their villas and the answer has been, something the Maldives has plenty of, over the water. 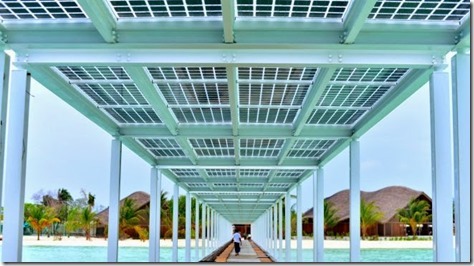 So their welcome jetty and their water villa jetties are rooved with large solar arrays. It’s not only eco-friendly, but it’s a great way to provide a shaded walkway (no more burning your toes on hot timber) and has a stylish design flair to boot. One of the things that I have decided to add to the Resort Profiles after this tour is a picture of the “Welcome Jetty”. It is a feature that does vary dramatically from resort to resort. I don’t think that prospective guests will choose their resort on it, but I think it is one of those details that provides a glimpse into the style and character of the property. Club Med Finolhu Villas certainly stands out in this regard with a greeting of style and innovation.